Tariffs and a flattening yield curve are likely culprits in negative momentum. Negative momentum, as measured by the Ned Davis Research CMG US Large Cap Long/Flat Index’s (NDRCMGLF Index, or the Index) model, has been deepening incrementally since the 80% equity allocation triggered in April. Increased concern over evolving tariff policy and the potential repercussions may have influenced the more recent price action at the industry level, helping to reinforce the model’s 80% equity signal. Yield curve flattening, mainly driven by monetary policy, has been another factor potentially weighing on investor concern. 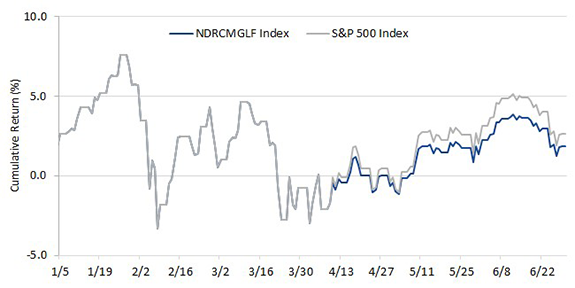 While the S&P 500 Index’s top-line return closed the quarter in positive territory, the NDRCMG model’s score has trended lower, gaining some negative momentum over the last few weeks of the second quarter. The model’s score closed the month of June below 65 – its lowest since the Index launched at the end of 2016. Source: FactSet. Data as of June 30, 2018. Past performance is no guarantee of future performance. Index performance is not indicative of fund performance. Indices are not securities in which investments can be made. Index returns do not reflect a deduction for fees & expenses. See index descriptions and additional disclosures below. In general, the S&P 500 Index’s 2.6% year-to-date performance was positively driven by its allocations to the technology and consumer discretionary sectors, while allocations to the financials and consumer staples sectors detracted from returns.1 However, the NDRCMGLF Index has lagged the S&P 500 by 0.46% (+2.2% vs. +2.6%, respectively) since its model de-risked in April and allocated 20% to T-bills. The model informing the Index can only, at most, keep pace with the S&P 500 during bull markets, as it is designed to outperform during market drawdowns by raising cash to limit losses. By limiting significant portfolio drawdowns, investors can be positioned to gain during market rebounds rather than having to spend that time recuperating losses. Underperformance, such as what has been seen year to date, may possibly be considered the cost of insurance toward limiting those losses from a significant market downturn—particularly if that drawdown resembles the magnitude of the last two major recessions in 2008-2009 and 2001-2002. As noted, the model’s composite score has trended under 65 more recently. Should the model’s composite score turn up and exhibit a meaningful positive trend, it would trigger a 100% equity allocation. 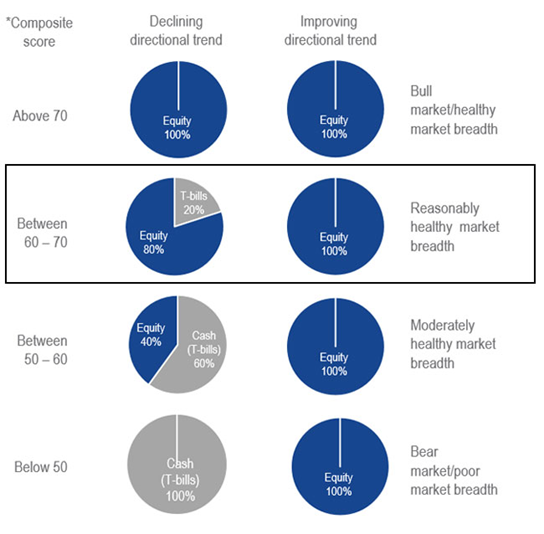 However, if the negative trend persists, pushing the model’s composite score below 60, for example, it would signal greater market breakdown and a 40% equity allocation, as illustrated in the table below. *Note: The composite score zone must be surpassed for the equity allocation change to be in effect. As an example, assuming the composite direction is down; i.e., a deteriorating/declining trend, if the score is 53 and it drops to 50, then the allocation is still 40%. The score must drop below 50 to move the allocation to 0%. Assuming the composite direction is up; i.e., an improving trend, it will always allocate 100% to the S&P 500, regardless of the current composite score. For illustrative purposes only. There are a few key reasons why measuring market breadth provides sound trend analysis for guiding equity allocations. The Index’s co-developer, Steve Blumenthal of CMG Capital Management Group, Inc., wrote a whitepaper, Risk Management for all Markets, detailing this tactical approach. Mainly, market breadth has typically weakened before top-line prices have at major market peaks and breadth thrusts5 often occur just before major bull market recoveries. Furthermore, the S&P 500 is considered a very efficient market, meaning the underlying securities’ fundamentals and macro environmental factors tend to be priced in almost immediately. Investors can access this equity risk-managed approach through VanEck Vectors® NDR CMG Long/Flat Allocation ETF (LFEQ®), which was developed to offer guided equity allocation by trading into and out of the market automatically for its investors. This strategy seeks to minimize losses from potential market drawdowns typical of traditional buy-and-hold or static strategies. 1Source of all data unless otherwise noted: FactSet and Ned Davis Research. Data as of 6/30/2018. 2Global Industry Classification Standard (GICS®) is a widely accepted equity securities classification system developed by Morgan Stanley Capital International (MSCI) and Standard & Poor’s. 3While the NDRCMGLF Index’s model computes a daily score, it does not mean that the allocations will change on a daily basis. The model is measuring multiple trends and countertrends over multiple terms, across multiple industries to assess market health and meaningful market trends. The model has produced five (5) trades year to date. 4When allocated to a percentage of equities (long), that portion of the Ned Davis Research CMG US Large Cap Long/Flat Index will comprise the S&P 500® Index. When allocated to a percentage of cash (flat), that portion of the Index will be allocated to the Solactive 13-week U.S. T-bill Index. 5Source: Ned Davis Research. Breadth thrust is a technical indicator used to ascertain market momentum and signals the start of a potential new bull market after what may have been an oversold market. The indices listed are unmanaged indices and do not reflect the payment of transaction costs, advisory fees, or expenses that are associated with an investment in any underlying exchange-traded funds. Certain indices may take into account withholding taxes. Index performance is not illustrative of fund performance. Fund performance current to the most recent month end is available by visiting vaneck.com. Indexes are unmanaged and are not securities in which an investment can be made.